Pro Ecclesia * Pro Familia * Pro Civitate: Fidelis Dismisses Religious Left Media "Report"
Fidelis Dismisses Religious Left Media "Report"
The groups hosted a press conference Tuesday at the National Press Club in Washington, D.C. featuring Rev. Brian McClaren of the “emerging church,” Rev. Dr. Jim Forbes, host of “The Time is Now” on Air America, Rabbi David Sapperstein, Director of the Religious Action Center of Reform Judaism, Rev. Dr. Bob Edgar, National Council on Churches, Alexia Kelly, Catholics in Alliance for the Common Good and Dr. Iva E. Carruthers of the Samuel DeWitt Proctor Conference. “The members on today’s panel constitute the ‘Who’s Who’ of the Religious Left, and have lost touch even with the mainstream beliefs and practices of religious Americans, particularly on matters concerning the sanctity of all human life and traditional marriage,” Cella said. McClaren refers to God as a “chick” and questions God’s sovereignty over and knowledge of the future. Forbes authored an article entitled The Moral Urgency of Electing John Kerry. Sapperstein is a board member of People for the American Way, a close ally of Planned Parenthood, and filed a legal brief with the Supreme Court in opposition to the federal ban on partial birth abortion. Edgar is a former pro-abortion Democratic Congressman from Pennsylvania. Alexia Kelly, is the former Director of Religious Outreach for the Democratic National Committee, spearheaded the website www.kerrysharesourvalues.org, and was “Religion Advisor” to John Kerry’s presidential campaign in 2004. ”Socially conservative religious populations in America today are flourishing, while liberal religious movements are fracturing. This fact makes it extremely difficult to put a religious face on a left wing political agenda,” Cella said. "Religious Coalition for Reproductive Choice"
Mark Shea: "Whores for Edwards Swings into Action"
"Not An Approved Catholic Voter Guide"
Toledo Blade: "Catholic Voting Guide Gives Church Perspective"
A convert to the Catholic Church who became Catholic because of a belief in and devotion to the Real Presence of Jesus Christ in the Eucharist. * A graduate of Baylor University and the University of Virginia School of Law. * Former Mayor of the Town of Columbia, Virginia. * Married with four children: two boys and two girls. 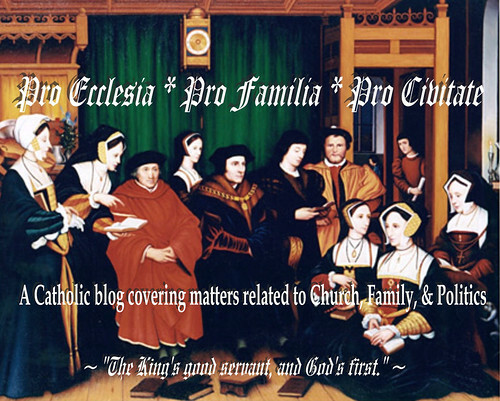 * Primary interests include the Catholic Church, family, Early American History, and law/politics * Primary purpose of this blog is fostering enlightened discussion about the roles played by the institutions of religion, family, and state in our daily lives. 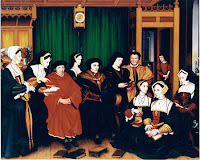 * Under the protection of St. Thomas More, martyr, and patron of lawyers, judges, civil servants, politicians, statesmen, and large families (not to mention troubled marriages). Pray that, for the glory of God and in the pursuit of His justice, I may be able in argument, accurate in analysis, keen in study, correct in conclusion, loyal to clients, honest with all, courteous to adversaries, trustworthy with confidences, courageous in court. Sit with me at my desk and listen with me to my clients' tales. Read with me in my library and stand always beside me so that today I shall not, to win a point, lose my soul. Pray that my family may find in me what yours found in you: friendship and courage, cheerfulness and charity, diligence in duties, counsel in adversity, patience in pain -- their good servant, and God's first. AMEN. Dear Scholar and Martyr, it was not the King of England but you who were the true Defender of the Faith. Like Christ unjustly condemned, neither promises nor threats could make you accept a civil ruler as head of the Christian Church. Perfect in your honesty and love of truth, grant that lawyers and judges may imitate you and achieve true justice for all people. AMEN. "Give me the Grace Good Lord, to set the world at naught; to set my mind fast upon Thee and not to hang upon the blast of men's mouths. To be content to be solitary. Not to long for worldly company but utterly to cast off the world and rid my mind of the business thereof." "What does it avail to know that there is a God, which you not only believe by Faith, but also know by Reason: what does it avail that you know Him if you think little of Him?" "The things that we pray for, good Lord, give us grace to labour for."